Each box contains 2 blister strips. Mifeston strip: 1 strip contains 1 tablet of Mifepristone INN 200 mg.
Cytomis 200 Buccal Strip: 1 strip contains 4 tablet of Misoprostol BP 200 microgram. Mifepristone is an antiprogestin; that is, it blocks the action of progesterone, a naturally produced hormone that prepares the inner lining of the uterus for implantation of a fertilized ovum and support of a growing embryo and placenta. The drug is taken orally in a prescribed dose during the first seven to nine weeks of pregnancy, and within two days the uterine lining begins to deteriorate, usually causing bleeding similar to that experienced during normal menstruation. The Mifepristone is then followed up by a dose (taken orally or as a vaginal suppository) of the synthetic prostaglandin, which stimulates the uterus to undergo contractions. The embryo and other uterine contents are expelled in a process very similar to spontaneous abortion or miscarriage. Misoprostol is a synthetic prostaglandin E1 analogue that has uterine contractibility properties. Misoprostol interact with specific receptors on myometrial cells causes myometrial contraction thus soften & open the cervix resulting in the expulsion of uterine contents. 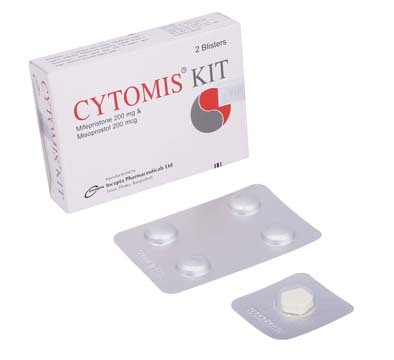 Cytomis Kit is indicated for early Menstrual Regulation (MR) up to 9 weeks (63 days) of gestation; i.e. for medical termination of pregnancy. Cytomis Kit can only be prescribed by qualified medical professionals who are able to assess the gestational age of an embryo and to diagnose ectopic pregnancies. One tablet of Mifepristone (200 mg) is taken in a single oral dose under the supervision of a qualified medical professional in a clinic, medical office or hospital. 24-48 hours after ingesting of Mifepristone tablet, the patient takes 4 tablets of 200 microgram (800 micrograms) of Misoprostol buccally. Misoprostol tablets can be administered by the patient herself (place two tablets on each side of cheek & gum). She should wait for 30 minutes. During the period immediately following the administration of Misoprostol, the patients may need medication for cramps or gestational symptoms. The patient should be given a phone number to call if she has questions following the administration of Misoprostol. Patients must return to the clinic, medical office or hospital within 10 to 14 days after the administration of Mifepristone. This visit is very important to confirm by clinical examination or ultrasonographic scan that a complete termination of pregnancy has occurred. Patients who have an ongoing pregnancy at this visit have a risk of fetal malformation resulting from the treatment. Surgical termination/MVA (Manual vaccum Aspiration) is recommended to manage Menstrual Regulation (MR)/termination of pregnancy failures. Mifepristone: The treatment is designed to induce the vaginal bleeding and uterine cramping necessary for menstrual Regulation (MR). Commonly reported side effects were nausea, vomiting and diarrhea, pelvic pain, fainting, headache, dizziness and asthenia occurred rarely. Misoprostol: Gastro-intestinal side effects like diarrhea, abdominal pain, nausea, flatulence, dyspepsia, headache, vomiting and constipation, shivering, hyperthermia, dizziness, pain due to uterine contractions, severe vaginal bleeding, shock, pelvic pain, uterine rupture (requiring surgical repair, hysterectomy and/or salpingo-oophorectomy). Mifepristone & Misoprostol combination should not give to anyone else. Administration must be under the supervision of a qualified physician. The combination of Mifepristone & Misoprostol has been prescribed for the patients specific condition, it may not be the correct treatment for another patients, and may be dangerous to the other women if she is or were to become pregnant. Any intrauterine device (IUD) should be removed before treatment with Mifepristone begins. Menstrual Regulation (MR) by surgery is recommended in cases when combination of Mifepristone & Misoprostol fails to cause Menstrual Regulation. Patients who have an ongoing pregnancy at last visit have a risk of fetal malformation resulting from the treatment. Surgical termination/MVA (Manual vaccum Aspiration) is recommended to manage Menstrual Regulation (MR)/termination of pregnancy failures. Mifepristone is indicated for use in the termination of pregnancy (through 63 days pregnancy) and has no other approved indication for use during pregnancy. Mifepristone: It is not known whether Mifepristone is excreted in human milk. Many hormones with a similar chemical structure, however, are excreted in breast milk. Since the effects of Mifepristone on infants are unknown, breast-feeding women should consult with their health care provider to decide if they should discard their breast milk for a few days following administration of the medications. Misoprostol: Although it is not known whether Misoprostol or Misoprostol acid is excreted in human milk, Misoprostol should not be administered to nursing mothers because the potential excretion of Misoprostol acid could cause diarrhoea in nursing infants.